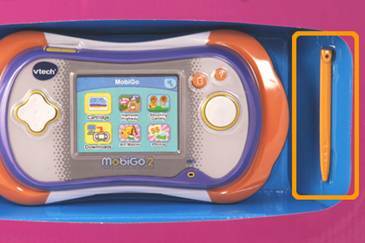 The MobiGo® 2 stylus can be found inside the packaging next to the main unit. Please be careful to remove the stylus from the package before throwing it away. • Use only enough pressure to operate the game. Too much pressure may damage the touch screen. • Do not use the stylus if it is broken. 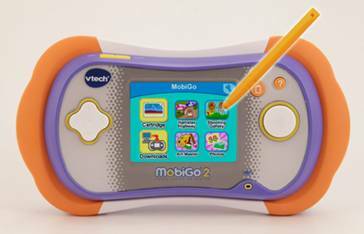 • Do not use any other stylus on the touch screen other than the MobiGo® 2 stylus. Always put the stylus back into the stylus holder for storage. 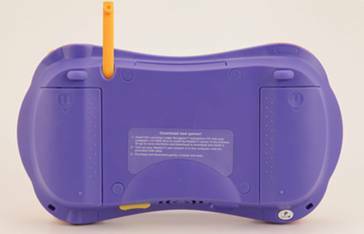 NOTE: If you lose your stylus, VTech offers replacement stylus packs for sale at www.vtechkids.com. Please select a replacement stylus pack that was designed specifically for your toy.